In a few more days it will be Halloween, and I’d say there will be a good many witches wandering the streets. You know the look – a pointy crooked hat, a black cloak, a long warty nose, maybe even a broomstick. The kind of thing you’d see in a rendition of The Wizard of Oz or Hansel and Gretel. Fantasy stories are so often populated by witches that we barely bat an eyelid at their mention. We dress up as them, sometimes even wish we could be them, and fantasise about receiving our letter from Hogwarts. What we rarely give a thought to is that a few hundred years ago, a witch was more than just something from a fantasy story… and it was one of the last things you’d want to pretend to be. 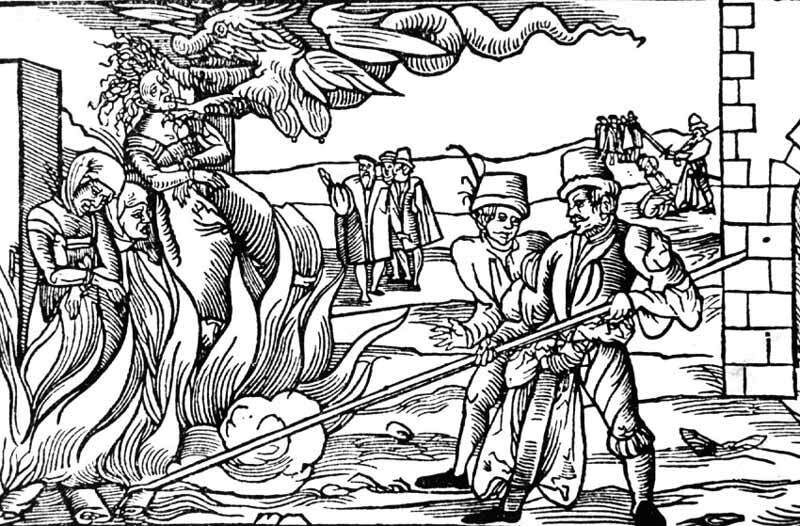 Of course, I’m talking about witch hunts in the middle ages. It might seem unusual, but for me it’s these that always come to mind when I see a depiction of a witch. Why? Well, it all started with a book. A couple of years ago I was writing a fantasy novel with a heavy focus on witch hunts and witch burnings. I hired Witch Craze: Terror and Fantasy in Baroque Germany out of the library, expecting it to be a dry, historical account, but nonetheless something that I could mine for details and inspiration. By the time I finished reading it, however, I’d emerged with a whole lot more than that. I’d always known about witch hunts and the awful things that were done to people accused of witchcraft in the 16th, 17th and 18th Centuries. But this book impressed on me, in a way nothing else had, just how extensive, brutal and tragic they were. It told detailed, individual stories of real people who were accused, tortured, and executed as witches. It revealed the staggering numbers of people who died this way (about 25,000 in Germany alone). It painted a detailed picture of society, and the many complex factors that contributed to the mass-trials and mass-executions of “witches”. It’s so easy to look back at people who believed in witches and distance yourself from them… dismiss them as deluded and uneducated. But if you try to look at it from their perspective, if you imagine what it would be like to live in that society… you can see why they believed in witches. When you were accused of witchcraft, you were tortured until you confessed. So naturally… people confessed. But it wasn’t enough to just confess. You had to furnish your story with details. Yes, this often meant naming other ‘witches’, but it also meant getting specific. It meant describing exactly how the Devil had seduced you, and all the awful things you had done (e.g. eating babies, killing people, making people or animals sick). And if the interrogators didn’t think your story was complete or believable enough, if they didn’t think you were telling the truth… well, they just kept going until they thought you were. This created a situation where dozens of people, sometimes even hundreds (if there was a mass panic), were telling detailed convincing stories that seemed to match up. They described the Devil as looking and behaving in a similar way. They confessed to cursing children or people that had recently died or fallen ill. They furnished their stories with small details from daily life that made them seem very convincing. From the modern perspective, it’s obvious that these desperate souls were inventing a web of stories from local gossip and the confessions of others to avoid more torture. If you had lived at the time, however, in a very religious and superstitious environment, surrounded by others who believed (including clergymen and people in power), and listened to accused witches giving their shocking and convincing confessions (often aloud before their executions) – well, you just might have believed it too. It’s easy to see the people who extracted confessions and applied torture as murderous sadistic villains… and I guess some of them were. But the truth is that many of them truly believed they were doing God’s work and fighting the Devil – who was to many at the time just as real and present as God. Not only that, they believed they were helping their victims. Because if a person confessed – if they admitted what they had done and rejected the Devil and begged god for forgiveness – they could save their soul. Amazingly, after confessing, some of the accused would even thank their interrogators for purifying and saving them. Whether out of fear, or out of insanity from all the torture, who knows… but the interrogators would have surely seen it as proof of their good work. When you grasp the depths of this religious fervour, it also renders the plight of those accused even more tragic. Many endured torture for months, even though it was always going to end in execution. While some were surely motivated by the drive to live, or by the sheer outrage of being falsely accused, many would have also been motivated by concern for their soul. These people, unless tortured to a point of insanity, knew they were innocent. So confessing to witchcraft and asking god for forgiveness… that would have been lying. And lying to god meant potentially damning their soul. Thus, not only did many know they were innocent and that they were going to die anyway… they knew that their confession was a lie, and that offering it might deny them access to heaven. One of the other things I found particularly tragic and disturbing about the witch hunts was the disdain and prejudice toward older women that they revealed. Elderly women were often marginalised, and had difficulty surviving and finding purpose in a society where youth, beauty and fertility were the sought after attributes in a woman. If they didn’t have husbands or children, they were especially vulnerable. Some of the stories are truly heart breaking… an old woman being dragged in front of a court, accused en-masse by her fellow townsfolk (sadly, it was often nice things like giving food or looking after children that would then ‘incriminate’ her when the child or recipient of the gift later fell ill or died), tortured till a confession could be extracted (often for months if she refused to confess), and executed. So now, every time I see the stereotype of a witch – with the wrinkly face and the grey hair and the wart on her long nose, cackling or croaking in a raspy voice – it makes me a little sad. That image accentuates, to a grotesque point, the features of an old woman, and it’s a product of the disdain and revulsion felt in medieval society toward older women. How Could People Turn on Friends and Family? So when you see all this, all the cruelty… you ask yourself how could people subject others, among them fellow townsfolk and even friends and family, to such awful deaths? Well, looking at infant mortality rates and the affect of famine and disease, you can see how hard life was at the time of the witch hunts. People were both religious and very superstitious, and they were eager to find explanations for the misfortunes in their lives (e.g. the death of a newborn child). So it’s no surprise many looked on gladly when they saw their community being purged of ‘evil’, and jumped at the chance to blame their unhappiness on others. At the same time, if there was hatred or mistrust between family members or friends, accusing someone of witchcraft was also a good way to get rid of them. I know these witch hunts happened a long time ago, and they don’t seem as immediate and important as atrocities from more recent history… but they were atrocities. Innocent people, often vulnerable older women, outsiders or people with a disability, were tortured, shamed and murdered. Towns with crazes often executed hundreds of people within the space of a few months. So in my writing, even though supernatural things do exist, I’m careful about how I treat the notion of witches. I try not to portray “witches” that get executed as being evil or deserving of their fate, and I also make it clear that not all the people in my novel who get executed have supernatural powers. Many are just unlucky, falsely accused souls. I also try to avoid the ‘evil ugly old woman’ witch stereotype. Fantasy is made-up: we all know it proposes an invented unreal world. But somehow, with my own story being set in the real world and referencing realistic witch hunts, I felt it would be disrespectful to imply that all those people really were witches, and worse, that they deserved what they got. The witches we imagine today are usually of a very different kind to those of the medieval imagination. They are the magical people that populate stories with wands and potions, able to be either good or evil. But for many people living during the witch hunts, witches were the servants of the Devil, and they were a reality. They did believe in witches. They killed and tortured because of it. And those thousands who died obviously weren’t witches. They were normal people who went through torment before being unjustly executed. So while the witch in Hansel and Gretel might be easy to hate, I always spare a thought for what that witch represents, the society she reflects… and what a world where people believe in witches can look like. I love this blog. It’s so true that people can turn on each other in anger when the world seems to have wronged them. I worked through a bit of this in my forthcoming novel, The Grimhold Wolf, where my villagers were hunting demons and werewolves rather than witches. It’s very gothic, and I always imagined the villagers turning up with pitchforks and torches near the end, just like in all the movies. But in further rewrites, I plumbed more into that village mentality and what would be the sequence leading to a pitchfork mob. It made for a deeper, more complicated story. This really does come back to the psychological behaviour of crowds as well as the general nasty attitudes people had toward each other. You have to ask are we any more enlightened today? Presumably there’s not much burning at the stake going on but well there are other ways to torture people…. Interesting post. I think a great deal of the fear toward witches in the old days came from the city vs. country divide. That divide is still very much alive in this country, and won’t be disappearing any time soon. City slickers tend to look down on their country cousins, and distrust their contrasting lifestyles and worldviews. As it was then, it’s still “Red” states vs. “Blue” states.